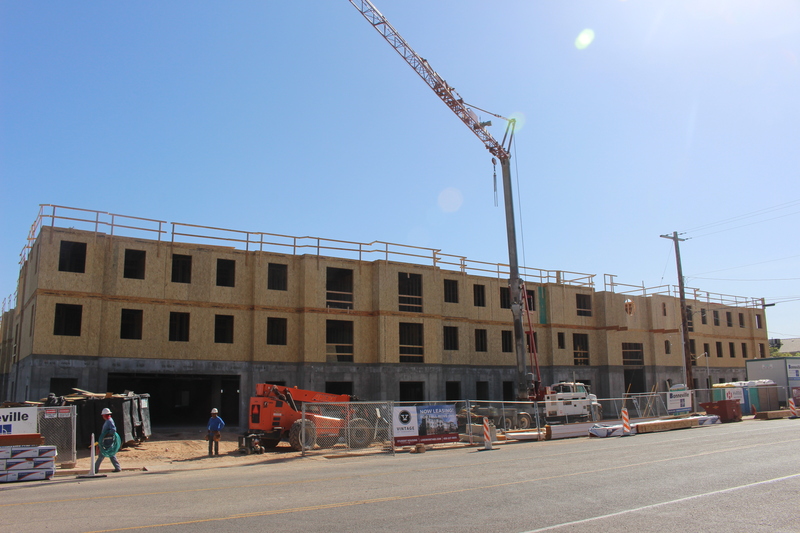 ST. GEORGE — A student housing apartment complex that is rapidly nearing completion promises to introduce an alternative to the oft-crowded experience of traditional student housing for Dixie State University students by offering private rooms and a more intimate setting. Vintage at Tabernacle, located at 850 E. Tabernacle St., St. George, only recently began construction and is on slate for completion in early August. The 265-bed apartment complex is being billed as “boutique housing” by developer Redstone Residential because of its smaller size and courtyard-oriented design. “In a lot of traditional student housing markets, places like BYU … you’re looking at complexes with 700 to 1,000 people,” Grant Collard, CEO of Redstone Residential, said. Provo-based Redstone Residential takes the approach that smaller is better, Collard said, lending to a better overall experience for students during their formative college years. Vintage at Tabernacle’s courtyard design facilitates a more social experience where one needs only look out their window to see what’s going on, such as a pool party. The concept is already proving to be a popular one with apartment leasing reportedly going fast, an apparent reflection on the fact that such housing options are severely limited in the area. 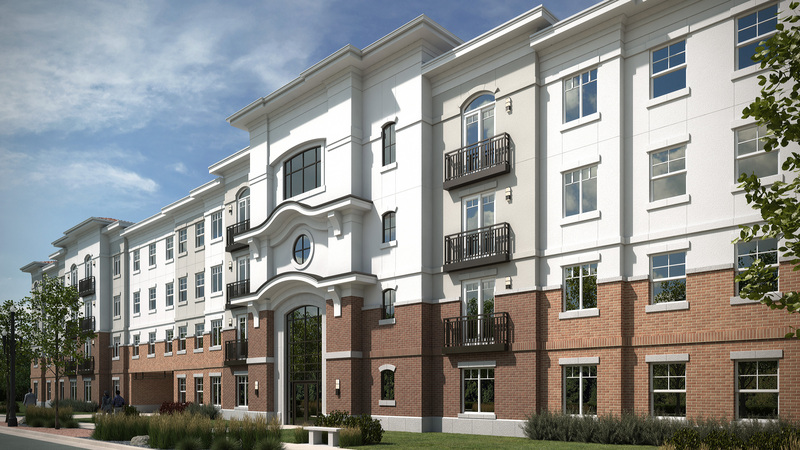 An architect’s render of the forthcoming Vintage at Tabernacle student housing complex under construction at 850 E. Tabernacle Street, St. George, Utah | Image courtesy of Redstone Residential, St. George News | Click image to enlarge. Dixie State University officials have taken interest in the project since its design was first presented to city officials approximately two years ago. “Dixie State intends to increase enrollment; it would be difficult to grow if there are not enough bed spaces to accommodate incoming students. New developments like Vintage at Tabernacle help meet the demand for student housing by providing additional beds near campus,” Seth Gubler, DSU’s director of housing and residential life, said. Current enrollment numbers stand at about 8,500 students. The university is also encouraging developers like Redstone Residential to renovate existing buildings to serve as student housing. “We need to continue to update and renovate older buildings as the budget allows. Also, the campus master plan includes replacing the old dormitories with new student housing buildings similar to Campus View Suites,” Gubler said, referring to the school’s new on-campus housing complex. Redstone Residential is no stranger to the area and already manages a cumulative 400 beds in student housing complexes that it has recently renovated in the St. George area. Key to growing the student body is convincing prospective students to enroll. A major factor in that decision comes down to what kind of housing options are available. As the university attempts to recruit students from out of the area, such as from northern Utah, Nevada, Arizona and California, housing has come into play as needing improvement. Currently, student housing options in northern Utah are much more varied than options students have in Southern Utah. How and where a student lives are often make-or-break deals for prospective students and their parents in choosing a college or university. “There are not enough on-campus student housing beds to accommodate everyone wanting to live on-campus. Many parents of out-of-state freshman want their students to live on-campus,” Gubler said. 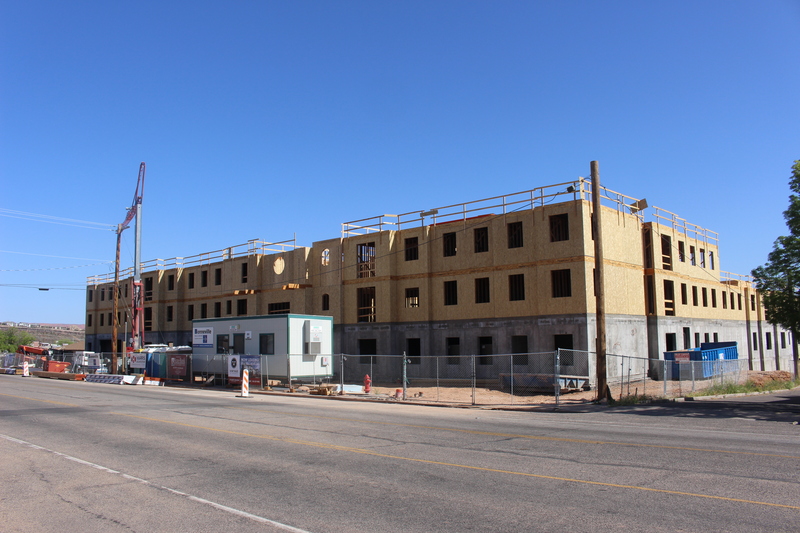 Redstone has already acquired additional lots near Dixie State University with the intent to build more complexes with the boutique housing concept in mind. Its next project includes a 500-bed complex on a 3-acre plat near the school to be built after Vintage at Tabernacle is up and running. Even at two months behind its original schedule, Vintage at Tabernacle is on track for completion by early August so students have plenty of time to get moved in before the school year starts. “We’re feeling really good about the schedule,” Collard said. Nearly all of the project’s subcontractors are based in Southern Utah. The framing has gone exceptionally fast thanks to the efforts of Zitting Framing, Collard said, adding that they specifically contracted with the company to finish the job quickly. Zitting Framing’s foreman Patrick Barlow has been instrumental in the framing job, expediting the process by utilizing a framing yard across the street from the construction site where walls are prefabricated then lifted into the main construction site via crane. Vintage at Tabernacle’s completion date is Aug. 4. Leasing is reportedly going “incredibly fast,” and prospective renters may apply for remaining rooms at the Vintage website.